Back of video room with rear projection. 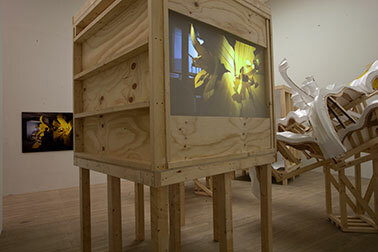 View of rear projection and back of installation. 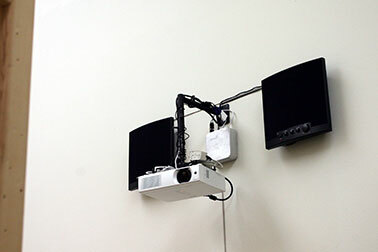 The rear projection system, powered by a Mac Mini with a custom aluminum enclosure, etched with project title and edition information. The chair is the the director of the museum's meeting room chair, and the initials are etched in the top. 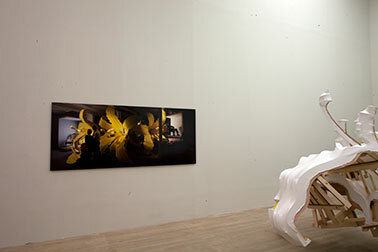 We placed details of the original set inside the newly fabricated rooms, similar to the lilies. Here you can see the original grey wall and hardwood floor. Actually, the floor isn't original to the set, but a piece we got from a 100 year old church floor in Massachusetts. 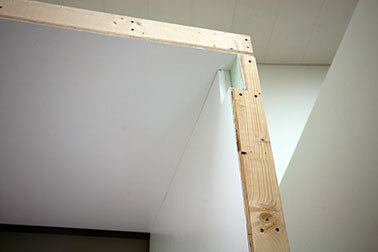 Here is a detail in the video room with the original green wall from the set inset into the refabricated room, similar to the yellow pieces in the lilies. 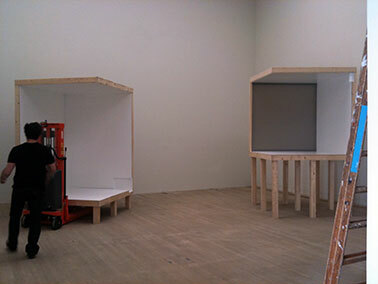 Here you can see the two rooms (read below for details), and all the lily pieces uncrated, waiting to be installed. 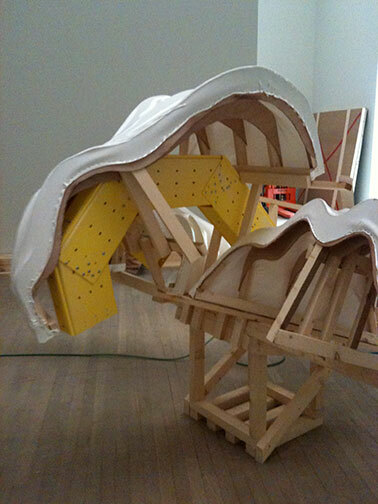 We’re assembling the base for the low lily. The museum staff (thanks Lars!) had already built our two stage rooms when we arrived from our blueprints. The grey wall is a rear projection video screen. 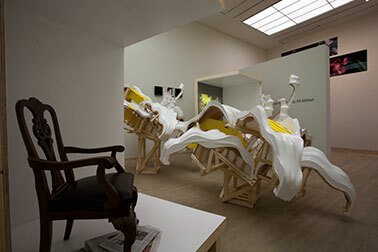 If you look carefully you’ll see insets designed into the structure in which we’ll place “artifacts” from the real set (similar to how the white lilies hold “artifacts” from the original yellow lilies). 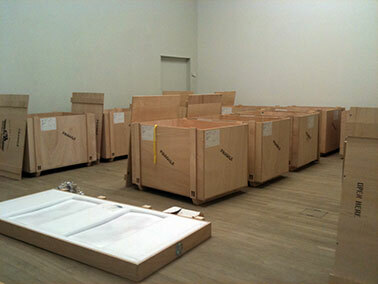 Our installation arrived at the Kunsthallen Brandts museum in 14 crates. It took us a day to unpack all the components and start to put it together. 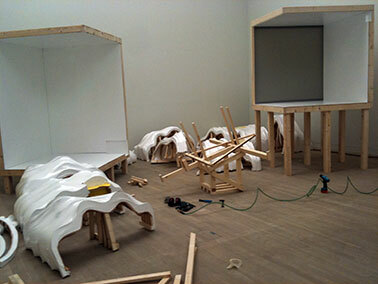 For the next 6 days we're installing What We Loved and Forgot at the Kunsthallen Brandts museum in Odense, Denmark. 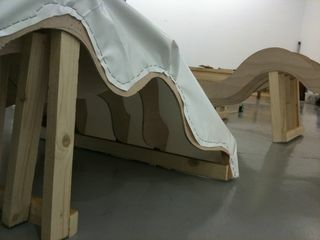 We'll be posting our daily process here leading up to the opening on Thursday July 24th. 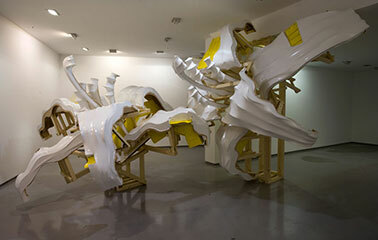 Here’s the final image of our project installation in Athens, Greece at Qbox Gallery. 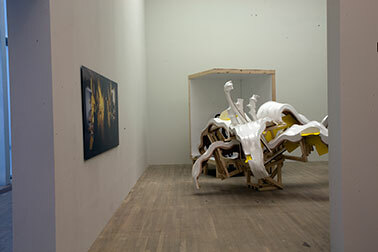 It’s on view till May 18th, 2010. 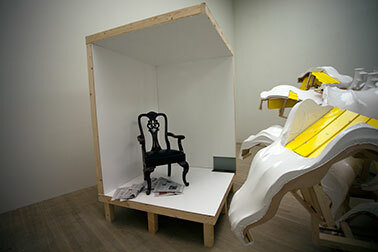 The installation features three project components: 1) the photograph 2) the video and 3) this new installation. 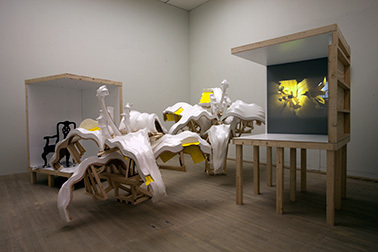 This installation features flowers that are “reconstructed” from the original installation components that are embedded inside it. 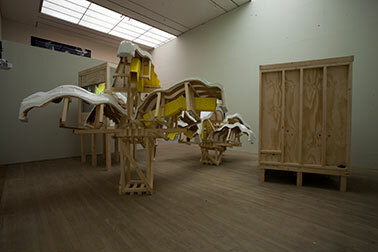 This installation will travel to Denmark this June to be a part of the Wild Things Exhibition at the Kunsthallen Brandts Museum. Murray and I are currently in Athens, Greece installing our exhibition What We Loved and Forgot at Qbox Gallery. 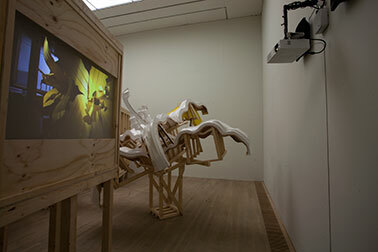 What We Loved and Forgot is a single channel video, a large-scale photograph and a site-specific video installation exhibition. 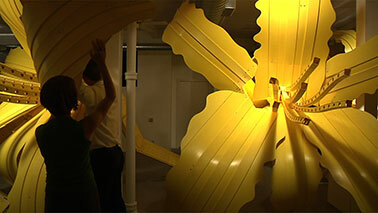 In our studio in Providence, we built three large lilies from yellow plastic to create the set for the photo and video. 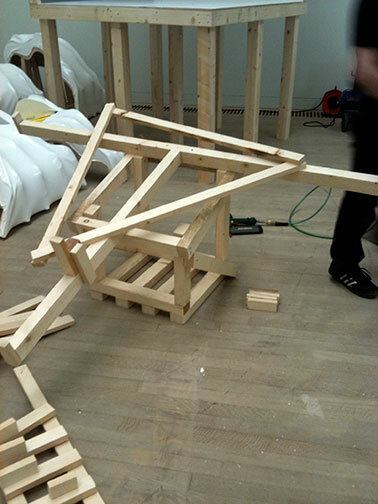 For the installation, we are making three lily structures out of wood and white heat-shrunk plastic in the gallery space. Using pieces of the original flowers from the set as a starting point — like shards of an ancient vase used to form a modern-day recreation in a museum — we are building a reconstructed version of the original flowers. 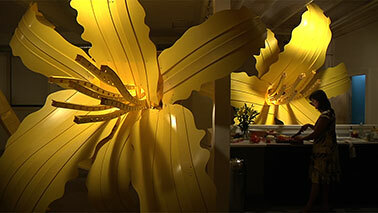 These new hybrid lily structures create an alcove that the audience can enter to see the video and photograph. 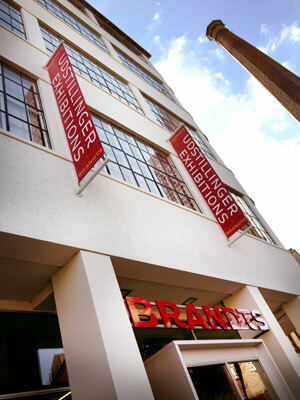 The opening is on Saturday. Thanks to a FANTASTIC crew, we just completed the second (and final) film and photo shoot for the lily project (which will soon have a name). 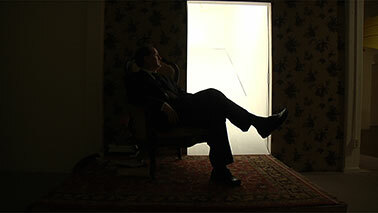 We're very excited about the video, which will be coming soon. 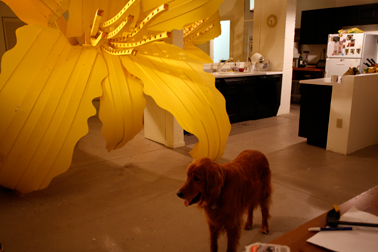 We’ve been working on this project since the summer, and since we live in our studio, we’ve gotten quite used to the presence of these flowers. Murray and I have internalized new paths to the front door, zigzagging around all the large yellow obstacles without a second thought. The dog and cat duck through the petals, no trace of their initial wariness. These flowers are just a part of normal life these days. So it threw things off a bit when we put the lilies on wheels a few days ago and started moving them around. It used to take three people and lots of verbal coordination to move a single lily. Now, one person can do it with ease (and an eye fixed on the sprinkler system nozzles). The wheels have enabled us to fuss with composition and camera angles on a whole new level. It’s been enormously helpful to set up a shot, look through the lens, make an adjustment, take a few shots, load the images up on the computer, make more adjustments. For the next project, though, we’re building a scale model. Re-shoot is scheduled for Nov 15. 1) We're considering a new choreography style that has radically less instruction for performers. We want to get the balance right between our interests and our performers (or collaborators) interests. 2) What we're calling "the Living Room Stage" needs to be rebuilt (and with more elements) at an angle to the entire production. 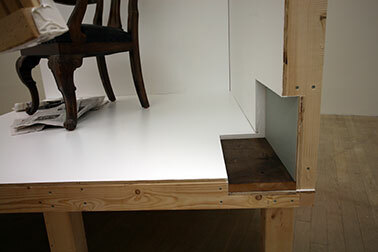 3) The white ramp has to be lowered. Our performer Bill is a champ but we were a little bit too enthusiastic with the incline angle. Further, the white space needs to become pure white, without blemishes. 4) We're considering building a catwalk in the background for Bill to continue his path on (up high in the air–sorry again, Bill). 5) Another Lilly (or lily element) is needed in the background and parts of the foreground lilies need a tad more work. 6) The lighting needs adjustment.